The presence of Islam in Vietnam was recorded as early as 650 A.D. , but it was not until the 17th century, and again in the 19th century, did Vietnam see a widespread of Islamic influence in the country. Islam is primarily the religion of the Cham people, an ethnic minority related to the Malays, who mostly originated from Cambodia. Though the Muslims were largely oppressed in the past, modernization has seen a large change in the attitudes of the Vietnamese. These days, religious acceptance in Vietnam has led to a healthy respect for all religions, and has seen a huge increase in the number and diversity of religious groups. The steady increase in the number of mosques which can be found in all parts of Vietnam, and more so in Ho Chi Minh city, is testimony of its commitment to a Muslim friendly environment. Here are our pick of the best 5, in no order of preference, which are in close proximity to most tourism related activities. One of earlier and more impressive mosques in the city, the Saigon Central Mosque was built in the 1930s by the Indian Muslim community living in Ho Chi Minh. Boasting a well maintained interior and magnificent architecture, this mosque also offers a solemn and tranquil atmosphere; ideal for Muslim worshippers from all over the world. 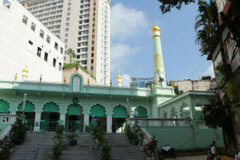 The earliest mosque In Vietnam, built in 1885, now sits proudly at the heart of Ho Chi Minh’s busiest district. Every Friday, this mosque sees swarms of worshippers, coming mainly from Malaysia and Indonesia. Its great location, coupled with its beautifully designed exterior, makes the Al Rahman mosque very appealing to Muslims travellers, and architecture lovers alike. In a district largely dominated by the Chinese-Buddhist community, it is very interesting to see a mosque(almost) rubbing shoulders with pagoda and temples. Cho Lon is more famous to many, as being the crown of Chinatown in Ho Chi Minh city. 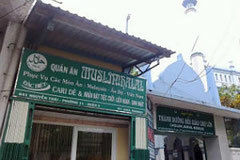 Hence, do stop by if you are a Muslim, and also plan to check out this area in Ho Chi Minh. 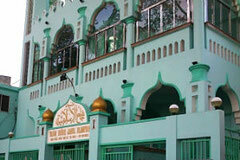 Another very popular mosque in Ho Chi Minh city, is the Jamiul Islamiyah mosque or Nancy Mosque. Catering mostly to the local Muslims, the mosque is considered to be one of the most primary mosques in all of Vietnam. Foreign Muslim visitors here can take the opportunity to interact with someone in the same faith, but from another country. The Jamiyah Islamic mosque is a place of divine worship for the Cham people who mostly practice Islam. Besides being a main prayer center, the mosque is also widely regarded as the representative office for Muslims in Ho Chi Minh city. Besides a worship hall, there is also a special area downstairs dedicated to the Islamic education for children. Contrary to popular belief and common knowledge, Vietnam does in fact, welcome and supports religious integration in its society. 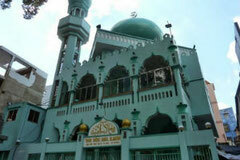 We have seen how pagodas, churches, and now even mosques become cornerstones of tourism activities in the city. Another surprise that we have for visitors checking out the above mosques in Ho Chi Minh, is that they are all surrounded by amazing halal Vietnamese food stalls. So, if you are not planning on having touristy meals throughout your stay, these stalls are great alternatives you should also consider.